Every year, the Earth has a certain limit to the natural resources it produces. This includes the oxygen it generates from plants and trees, the food it produces, the timber it can provide, the non-timber forest products we can gather, the life it can support. We, the advanced species that we are, have decided to take these resources for granted and have incessantly used up the resources the Earth generously provides, so much so that we have started taking MORE than what the Earth can produce in a given period of time. Thus, the concept of Earth Overshoot Day was born. This is the day that we use up the total amount of natural resources and ecosystem services that the Earth can provide for us in one year. Two years ago, I had written about this very day which fell on August 13th. 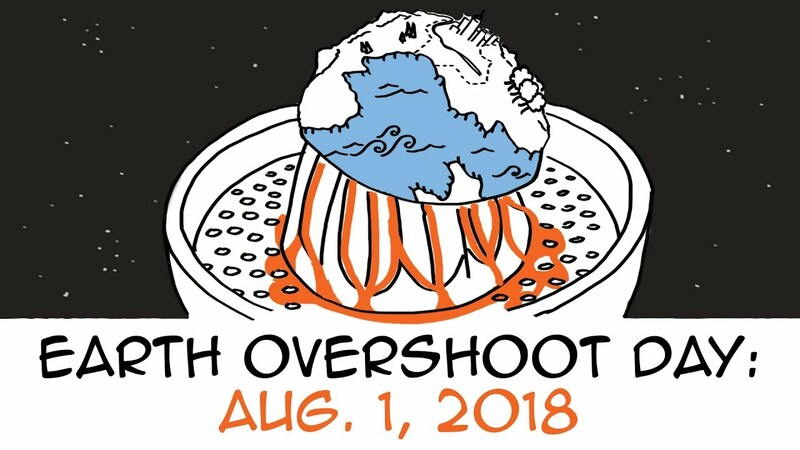 This year, the we overshoot Earth’s resources on 1st August. Basically, from August 1st onwards, we will be diving into our “savings”, so to speak. We will depend on the resources that Earth has built up over eons so that our march towards development can go on unstopped. But this “savings” account will not last long. The day is not far when we will be using up Earth’s one year worth of resources on January 1st itself! What will we do when there is no surplus resources to fall back on? It is time that we take control of our mismanagement. It feels very….useless (?) to say this over and over again but there really is nothing else to say. Energy efficiency- The world has reached grid parity in terms of renewable sources of energy. Especially countries in the tropics like India need to utilize the abundance of resources at their feet and make hay while the sun shines (literally). The use of fossil fuels will continue, no doubt. But the sooner we can phase out petroleum for natural gas and renewable sources of energy, the better chance we have of keeping up with our development needs and the cap on natural resources. Urban development- This is a pet project of mine that I hope to one day work on. Urban areas are fast growing and are expected to host most of human population in the years to come. However, there is a limit to the expansion we can do on urban areas. Horizontal expansion will eat up precious crop land and forest land, affecting our food sources, water sources, air quality as well as the lives of millions of other organisms. So how about we expand vertically? Every city has the potential to reach the skies (literally), and we now have the technology to achieve this. Urban forestry is another option we need to explore completely. The integration of forests in urban landscape will produce more resources that can be used within the city, and make the city a better place to live in. Vertical forests like this may be the way forward in urban development. Source: Google Images (World Economic Forum). Deforestation- This by far is one of the biggest reasons for the loss of natural resources. Reports indicate that less than 20% virgin forests remain in the world, and even these are slowly being eaten into by large, profit-driven corporations. It is important to remember the benefits we receive from safeguarding these forests. Also, sustainable forest management (see here, here and here) is a wonderful way to obtain forest based resources without exploiting forests to the point where we run them dry. Here are some steps that you can do (apart from the obvious ones you keep hearing) to help #movethedate back. Home gardens- By contributing to the urban forestry movement, you can help improve your own home environment by keeping just a few plants and maybe even a vegetable garden in your balcony. Check this video for more. Use your vegetable vegetable wastes to feed your home garden and experience nature’s way of recycling wastes right in front of your eyes! Khamba composting is a wonderful way in which you can easily achieve this. If you are interested, check out Daily Dump and buy one. The investment is worth it. A khamba composting unit. Source: Google Images. Always, always dispose electronic goods with someone who recycles them. There are many companies in India; find one near you! Last, but certainly not the least, if you know anybody who is undecided on a career path, suggest the path of an environmental scientist! At the end of the day, we need to do anything and everything in our power to #movethedate and make our survival a positive and controlled one. Good one Saurab. I feel things are moving so fast that the path through learning is so long that when people come out the other side with debts, that they are not free to think about protecting our precious Earth. We need practical para-ecologists, just like we have para-legals and para-medics. People who know enough to do initiate actions and do essential repairs. I imagine (and I’m sure I’m not the only one) a worldwide movement disrupting industries and organisations that they see as damaging the Earth. I imagine activities ranging from civil-disobedience to geoengineering from many small actions (no matter how ill-informed). Running via a headless activist meshwork using smartphones/web and older methods of communication. In the last year I’ve seen hints of this both IRL and on the web. That’s a really nice way to put it; para-ecologists. Yes, this is certainly one of the needs of the hour. You raise a very pertinent point when you say that after all the struggles and races we run, no one wants to think about the environment. Your imagination is certainly on point. It’s what we need; just like there are civil disobedience movements against lack of jobs, we need them against air pollution and water pollution. Only this will open the eyes of the governments and corporations. Would you like to share these visions and thoughts as a blog post? I’ll have to think about it a bit as am busy at moment and it needs a little headspace. And thank you! Glad you liked it.